Giffy dog: Why adopt a geriatric dog? Why adopt a geriatric dog? Last night I found myself filling out the paperwork for a dog I’ve been fostering for a year and a half. It was time. Bear’s been in and out of my life for nearly 10 years now, and I realized why it’s taken me so long to find him the perfect forever home: I wasn’t ready to send him off into the unknown again, not this late in his life. I was reminded, as I filled out the adoption paperwork, of another geriatric dog I adopted nearly a decade ago. 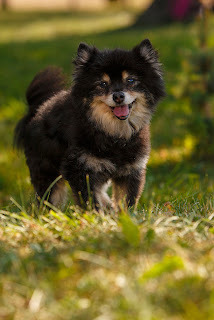 Muffin was my first, an 11-year-old red Pom-schipperke cross that had been brought to a veterinarian to be euthanized after her person died. The vet, whose name I never learned, decided to place her in rescue and found Second Chance a month after she was confined to a cage at the clinic. Her eyes, when she first arrived at my house, were flat; her mottled coat suggested that she probably didn’t have much time left, either, but she bounced back quickly. I little bit of love and freedom, and the light returned to her eyes, followed by a feisty personality. After a month or two, I adopted her into a home that seemed to be a good fit for her, until the family called me to tell me that Muffin was biting the family members. I was disappointed, but not surprised—although I hadn’t seen that behavior in my home. Eventually, a second home surfaced and then returned her after Muffin began nipping family members for confining her to a bathroom. I began to dawn on me that Muffin wanted to retire to my house. And, although I had no plans to adopt a dog at that point in my life, I did. I allowed my heart to open up to this little dog that wasn’t going to win any more beauty pageants. Muffin, you see, was a spitfire. She was happy in her retirement home; we were a great team, and she made me laugh and smile every day, despite vet visits and medications and the fact that her fur was beginning to resemble a muppet’s. She lived for more than a year longer, until one day the man I was dating gently pointed out that the medications were no longer controlling her breathing, that she was struggling to get air. It was time. Muffin left this world with the same pluck she lived in it. She did not go gently into that good night, but that was part of our journey together, too. In our final moments together, I realized I couldn’t imagine my life without her even though I had only known her for two years. Muffin enriched my life daily, and I know I’m a better person for having known her. Now I look at Bear, who has suffered a different set of experiences than Muffin, but no less challenging. I’ve known him since he was 4-years-old, when I first placed him in a “forever,” but for some reason I’ll never understand, that wasn’t our final meeting. And he’s not the same dog that he was in 2004. He doesn’t have the same energy, and his smells are a little stronger than they used to be. His body is more tired, too. Overall, he’s got less curb appeal than he did then, at least to the untrained eye. But to me? I see wisdom in him and a quiet acceptance of his life. He can curl up in my arms for hours, or anyone’s for that matter. He’s content to rest his bones sleeping in a patch of sun on the floor, and he’s happy just to get a meal and a few strokes. He gladly accepts the affection I give him, but unlike the younger dogs in my house, doesn’t ask for it. Because Bear asks for so little, I become more aware of him, notice him following me from room to room or waiting at the bottom of the stairs when I run up them. I try to give him everything he could want. Often, I carry him up and down the stairs with me, place soft bedding on the floor for him to lie one, bring him on visits to people who will allow him to rest in their arms, and indulge his insistent barking as I prepare his meals, his only obsession. It’s a quiet, gentle relationship, one based on acceptance and trust, and I wouldn’t trade it for anything. To know a geriatric rescue dog is to love him, as I love Bear. And whether we have 6 months together, or a year, it doesn’t matter. The only thing that really matters is that he’s home—at last.